"Gold is unique among assets, in that it is not issued by any government or central bank, which means that its value is not influenced by political decisions or the solvency of one institution or another." And that is why gold is the king of assets, Bernanke you great prune. 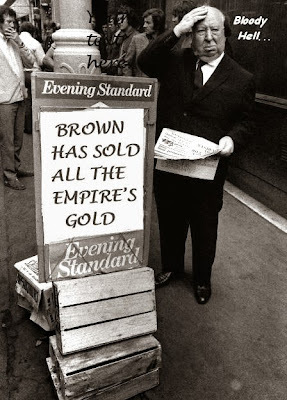 And thanks to Gordon Brown, the Brits have bugger all. At least the Germans have a receipt from the Fed in die keksdose. The other major European Central Banks (France and Germany) say in the second story below that "they will not sell their gold reserves, as they can provide a level of confidence, an element of diversification and can absorb some volatility from the central bank's balance sheet." This implies that they are not going to account for their gold at an artificially low fixed price on their Balance Sheet, as the Federal Reserve does at the ludicrously out of date price of $45 per ounce. But it is ironic that France confirms their gold leasing activities. If gold is an item on the balance sheet, one might expect a full disclosure of encumbrances and commitments for any variable balance sheet asset to be disclosed, ne c'est-pas? You know, any counterparty risks you may have accrued for a pittance of a yield on your premiere riskless asset. And they will get that gold bullion back once it has been melted down and shipped to China how? When first we practise to deceive." Theory founders on the rocky shoals of reality once again. This may get even more interesting than I thought, once gold breaks and run higher again. All those shorts to cover, and lease obligations to fulfill, and no one with bullion in size wishing to sell. Quel dommage! ROME, Sept. 30 (Reuters) - Gold reserves are a key element of central bank independence, said an official of Banca d'Italia in a conference on Monday, undermining rumors of the sale of part of its bullion assets. The crisis in the euro zone has triggered speculation that the central bank may have to sell some of its huge gold reserves to support its economy. Banca d'Italia has the fourth largest gold reserves among central banks in the world. In a speech at the annual conference of the London Bullion Market Association, Salvatore Rossi, CEO of the Italian central bank, said that gold had a specific role in the central bank's reserves. "Not only does it have essential characteristics that allow for diversification, particularly in financial markets that have been largely globalized, but it is also unique among assets because it is not issued by a government or central bank, which means that its value can not be influenced by political decisions or the solvency of an institution or another," he said. "These features, combined with historical factors and psychological stress the importance of gold as part of the reserves of central banks," he said. "Gold supports the independence of central banks in their ability to (act) as the ultimate guarantor of national financial stability." ROME, Sept 30 (Reuters) - Keeping gold reserves is a key support to central banks' independence, an official from Banca d'Italia told a bullion industry conference on Monday, dampening talk that it might sell some of its holdings. Speculation has emerged since the financial crisis hit the euro zone that Banca d'Italia might be pressured to leverage or even sell some of its huge gold reserves - the fourth largest among the world's central banks - to help prop up its economy. Regulations covering central bank independence restrict them from using bullion reserves this way, but concerns grew after an assessment of Cypriot financing needs prepared by the European Commission showed Cyprus under pressure to sell gold to raise around 400 million euros (341.1 million pounds) to help finance its bailout. In a keynote address to the London Bullion Market Association's annual conference, Salvatore Rossi, director general of the Italian central bank, told delegates that gold plays a special role in central banks' official reserves. "Not only does it have the vital characteristic of allowing diversification, in particular when financial markets are highly integrated, in addition it is unique among assets in that it is not issued by any government or central bank, so its value cannot be influenced by political decisions or by the solvency of any institution," he said. "These features, coupled with historic... and psychological reasons, stand in favour of gold's importance as a component of central bank reserves," he said. "Gold underpins the independence of central banks in their ability to (act) as the ultimate bearer of domestic financial stability." Italy holds 2,451.8 tonnes of gold in its reserves. A slim majority of Italians polled by the World Gold Council in March believed their government should use the country's gold holdings to offset high public borrowing costs, although they did not believe they should sell them. Italy used gold to collateralise bonds in 1974, when it received a $2 billion bailout from Germany's Bundesbank and put up 500 tonnes of metal as a collateral. Other European central banks including the Bank of France and the Bundesbank said at the conference that they will not sell their gold reserves, as they can provide a level of confidence, an element of diversification and can absorb some volatility from the central bank's balance sheet. "We have no plan to sell gold," Bank of France Alexandre Gautier, director of market operations department, told delegates in a presentation. "We are still active in the lending market, but not retail loans. We can see some yields that are attractive, but we realise that we can't lend gold without collateral." Gold price volatility this year has impacted the buying decisions of emerging countries' central banks like Argentina, Juan Ignacio Basco, deputy general manager at the Central Bank of Argentina, said. Bullion fell by $200 an ounce in two days in its sharpest slide in 30 years in April before hitting a three-year low in June and then regaining 13 percent from that level. "It's very difficult to decide when to enter the market as we don't follow trends ... (but) the recent volatility in prices has changed the way we have look at gold," Basco said. "That's why we have started with the product options because volatility in the market is not good for us." Argentina slowly re-started to rebuild its gold reserves in 2000s after selling them at the bottom of the market in December 1997 to buy U.S. Treasuries. (Q. What do Argentina and England have in common? Jess) It currently holds 61.7 tonnes of the metal, representing seven percent of its assets.